Birmingham Wholesale Market occupies a huge site, 28 acres of prime real estate a mere apple’s throw from New Street Station. It seemed inevitable that redevelopment and the commercial imperative would catch up with the vast 1970s concrete warehouses and that time has finally arrived; the traders have moved out, the bulldozers are on the horizon and squeezed in between, to conduct the last rites, are Friction Arts with their performance event Everything Must Go. Friction Arts are stalwarts of the Birmingham performance scene, burrowing their way into their local community to make true socially engaged art with an international perspective. Wholesale Market is right on their doorstep and they have long been building relationships there both with the weekday traders and the denizens of the site’s huge Sunday morning Car Boot Sale. Tonight’s requiem carried evidence of the investment made in these relationships and was charged with the company’s emotional engagement with the site and those who have animated it through almost 900 years of history. Site-specific events carry an frisson when the site is specifically somewhere you’re not normally able to access. 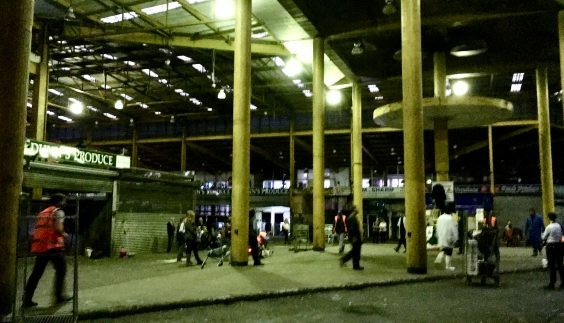 This evening a ramshackle group of us gathered beyond the security barriers and the vacant guard’s hut on the great concrete deck of the Market’s plaza. A beautifully produced Audience Manual gives us a brief history of the site as the very origins of the settlement that is now the City of Birmingham and a guide as to the art we will encounter within. We are admitted to an initial cavernous space designed as a drive-thru for articulated lorries but the entrance into the main trading hall is blocked by a very large screen carrying a video recording of a brightly lit wholesale market scene, passing vans, forklift trucks, piles of boxes of vegetables, traders and customers wandering around, a market day winding down. This scene spools on unblinkingly until eventually the image fades and the screen is slowly raised revealing the same scene here and now grey, hollow and apparently lifeless. Like many moments in the evening’s event it is a simple idea well realised and effective. The trading hall is vast, grim and intimidating, truly spectacularly Soviet-ugly, I like it. We are given time to explore artworks commissioned by Friction commissioned documenting or responding to the site; these range from Dan Burwood’s large, sombre photographic portraits of workers, to a witty sculptural of fruit trays held in place by miniature figurines. Marcus Belben had pulled together a lot of local history and in a small back office – whose wall was lined with photographs of the site in action – half a dozen telephone receivers carried aural histories from workers on the site. Not all the commissions were strong, some possibly weren’t shown to their best effect on site and there was always the lingering suspicion that you’d missed something out – which wasn’t necessarily such a bad thing. When as an audience we started kicking our heels, collectively acknowledging that with the best will in the world we weren’t going to read all the historical documents or listen to all the testimonies or sit through all the film loops, the worker/performers started to rattle into action, calling and whistling, pushing carts and cages and pump trucks. Eventually they coalesced at the centre of the three pronged building, on a form of traffic island whose perimeter hosts a series of vast cylindrical concrete pillars keeping the roof up and whose centre is marked by a totemic square pillar wearing a vast circular concrete collar maybe 6m from its base. The performers are in dirty work wear, boots and dark rubber gloves, they do jobs, they pile wooden pallets against the central pillar and hug the peripheral pillars. They embellish the pallets with more found objects, fake grass, golf clubs, some clothes on hangers, maybe a necklace and some half broken furniture. Everything is removed and then rebuilt, the hugging repeats. It becomes clear we’re not being told a story, we are watching something happening. There is an invocation of the market in the week and on the Sundays. There is a homage to and struggle with the fabric of the space. Vegetables and fruit arrive and a chopped up, ripped up and peeled, the shavings and peelings fall and with the performers circling rings emerge of different coloured offerings – a rangoli, the waste. This group performance section concludes neatly with a triangle of the performance space being enclosed by industrial cling film layered, higher and higher, partitioning the performers off from us and fading them away. We have smelt decay in the air, we have seen age old grime and fetid water, discarded materials, the fruit and vegetables but as yet no flesh, this is to come. Lee Griffiths’ voice booms out through the space, we seek it out and find his thin naked carcass cling-film wrapped from neck to knees to an old hand cart, half stood, half reclined facing us. This startling image quotes an initiation rite for newbies working on the markets, yet here the voice isn’t new but ancient. Griffiths recites etymological roots of Birmingham’s name, he invokes the spirit of the city and its markets, he acknowledges the energetic cycle of destruction and rebuilding which helps define the city, he links us, the City’s residents with those who have gone before us. As Griffiths is wheeled off, by a rather perfunctory stage manager, his place is taken and the mood leavened by a sprightly gentleman in a black yoked donkey jacket tap dancing to the evening’s first music – up until now a soundscape of found noises has echoed through the halls, but now there is music, as if the horns and reversing hazard sounds of all the trucks and fork-lifts have shifted pitches and come together to form a happy band. The dancer leads us to the golden centre of a vast spiders web that fills one end of the building’s north limb, where the flowers were sold. Entering the centre of the web we follow a long twisting tunnel made of broken down fruit boxes, black plastic and yet more cling-film. We have our hands shaken “goodbye”, “goodbye” we get an item of fruit with a label and thought attached and that’s us and it finished, out into the (relatively) fresh evening air. After months and months of anticipating this event the Friction team ultimately had to pull it together in double quick time and the did a remarkably good job in trying circumstances. Having once been called Funding Pending the company made excellent use of Heritage Lottery and Arts Council money to make a strong, slick and thoughtful piece that was big and bold enough to escape that fate of much site-specific work and not get overwhelmed by the site. I knew when to make some noise and spectacle and when to let the venue do its own thing. The event didn’t capture or remind us of the vibrancy, life and colour of the market, there weren’t the jokes, or the teasing, banter, robustness or camaraderie that one imagines filling the air in these dynamic work places; but tonight didn’t feel as if it was aiming to be a recreation or re-enactment of anything, ultimately if felt as if we were witnessing and part of a ritual, a ritual conducted with the fragmented remnants of something, a ritual conducted by artists to say goodbye and thank you to the Wholesale Market on behalf of a city.